Since Hollywood first appeared amidst the bustling beehive of Los Angeles, California, it became the Mecca for thousands of young men and women hoping to find fame and fortune in the film industry. But only a tiny percentage would ever realize those dreams. The majority would either return to their small town homes, find other menial employment or worse, end up lost souls beneath the heartless wheels of the motion picture world. Stephen Jared’s cautionary tale of Allyson Rockwell is such a tragedy and from the first page to the last, it is a grim, unrelenting descent into a young woman’s personal hell. Depressed and ready to call it quits, Allyson is within hours of taking a bus home when, on a whim, she goes to a glitzy Hollywood film premier and there meets a Lenny Carsen, a sadistic mobster who is captivated by her good looks. Seeing her vulnerability, Carsen convinces her to give up her plans of going home by suggesting he can get her a film contract. When he manages to make good on that promise, it is then simple for him to suggest Allyson move into his small home in the suburbs. Not wanting to appear ungrateful and still euphoric by having just signed a contract with Universal Studios, Allyson naively accepts Carsen’s offer. Days later, while in a drunken stupor, he rapes her on the kitchen floor. He makes it quite clear she can expect more of the same on a regular basis. Too ashamed to go to the police, Allyson is afraid a scandal would jeopardize her fledgling acting career which she had worked so hard to attain. But by choosing to keep her situation a secret, Allyson begins her descent into a dark, bottomless pit of despair from which there is no return. After beginning his writing presence with several action adventures, Stephen Jared focuses his considerable talent on his own back yard. A professional actor in both films and television, he is no stranger to the back office deals and exploitative manipulations young actors are subject to on a daily basis. It is this intimate knowledge of the players in this industry of illusion that lifts his tale to a level of poignant reality that is difficult to ignore. It is by far his most personal work and thus his best. 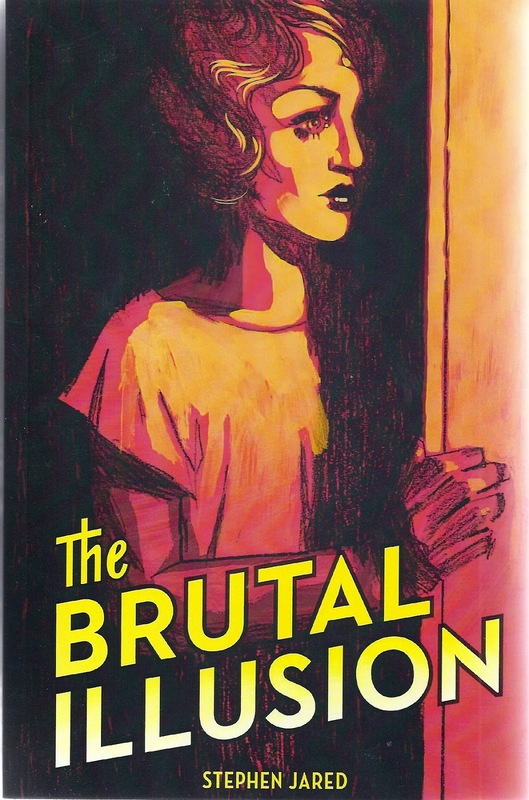 There are no happy endings in “The Brutal Illusion,” only broken hearts. Private Eye Mike Hammer’s closest friend is Homicide Detective Pat Chambers. The two fought together as Marines in the South Pacific and came home to join the police force together. But Hammer’s general dislike of authority soon had him setting up his own private shingle while Chambers worked his way up through the ranks as one of the most hard-nosed, honest cops to ever serve people of New York City. Now, with his promotion to Inspector locked up and a decent retirement only a few years away, an early case from the past resurfaces with newly discovered facts that may derail Chambers’ bright future and smear an otherwise untarnished career. A man then Officer Chambers had collared for a string of Bowery murders now appears to have been innocent all along and wrongly incarcerated for forty years. At the same Hammer is gunned down by professional assassin on his way to work one morning. It is only through blind luck that the two .22 slugs intended to shred his heart are stopped short by a recently purchased…. To say any more would spoil one of the most dramatic openings to any Hammer book ever imagined. Soon, the aging P.I. and his beautiful assistant, Velda, begin to suspect threads from a previous case are getting them targeted for death. Buried somewhere in the rugged mountains of the Adirondacks is a cavern containing ninety-billion dollars of stolen mob money stashed away by another of Hammer’s old war buddies. Before being gunned down, this old foxhole pal confided in Hammer the location of the treasure. Suddenly a whole lot of people, both lawmen and outlaws, suspect Hammer of knowing the location and they are willing to do whatever it takes to make him reveal it. Two disparate cases with no apparent connections; one forty years old, the other as fresh as Hammer’s healing bullet wounds. Yet, as Hammer starts digging into both, his well tested instincts begin sending out warnings that these two cases have a common dominator and unless he can find out exactly where they converge, Pat Chambers stellar reputation will be destroyed and a lot more people will die thanks to the diabolical orchestrations of a criminal fiend known as the King of Weeds. 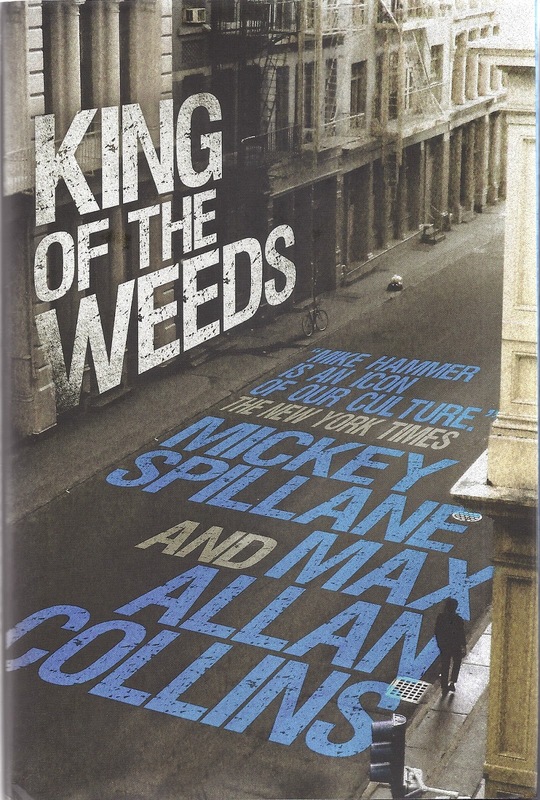 According to co-author, Max Collins, this book represents the last of six substantial manuscripts Spillane left behind, and was intended to be the last in the series, before he started THE GOLIATH BONE in response to 9/11. It is also the sequel to the last Hammer published in Spillane’s lifetime, BLACK ALLEY (1997) but can be read as a stand alone entry in the series. This reviewer has been a Spillane fan from the first time he picked up a Mike Hammer paperback as a teenager in the early 60s. That these unfinished manuscripts should be completed by the writer chosen s specifically by the character’s creator is a truly remarkable literary achievement in the history of mystery fiction and it is all too obvious that Spillane knew what he was doing all along. Collins, through his never wavering respect for these characters has delivered them to a finish line Spillane would have been proud of. Known for using that last sentence in his books like a final punch to put away his critics, Spillane wielded sentences like a surgeon’s scalpel with finesse and razor sharp precision. A skill he taught this Collins kid and when you read the last line in KING OF WEEDS, like me, you’ll have a wicked smile on your face. I guarantee it. One of the things I try my best to do when writing these reviews is to be honest with you, dear readers. Which is why, if you haven’t read the first book in this series, LEGION I – LORDS OF FIRE, then stop reading this and go out a pick up a copy now! Once you’ve finished reading it come on back. Of course, if you decide not to do that, then I have to advise you not to read this second volume. This in a tightly plotted trilogy and each book is intricately connected. By itself this book serves no purpose. That being said, LEGION II – SONS OF TERRA picks up where the first one ended, the human galactic empire having survived a demonic attempt at conquest as orchestrated by dark gods from another dimension. As this volume begins, the forces of mankind are engaged in stellar warfare throughout the galaxies and two outer world Legions are scattered over too many fronts guaranteeing their ultimate failure. General Ezekial Tamerlane, the chief aide to Supreme Ruler, suspects the coordinated attacks of their foes coming simultaneously is no coincidence but a well planned scheme by unknown forces. Have the demons from Underworld returned and if so, who exactly is manipulating them? Tamerlane’s dear friend and ally, General Agrippa of the Third Legion, is battling overwhelming alien armies with psychic weaponry and the defeat of his troops is imminent unless Tamerlane can muster fresh reserves to come to their aid. This he plans to accomplish by convincing General Iapetus to deploy his Legion II Sons of Terra in these outer world battles. But Iapetus, ordered by the Supreme Leader, Nakamura, to defend the planet Earth, has no intentions of wasting his legions on what he sees as a futile endeavor and ignores Tamerlane’s request. Unable to fathom Iapetus’ blatant insubordination, Tamerlane finds himself challenged both from without and within; surrounded by strange forces, demonic spies and suspicious agents of the Holy Church whose actions continue to fuel his paranoia. All of which comes to a startling confrontation on the Empire planet of Ahknaton where, in blood and death, the enemy will be revealed and all masks removed from friend and foe alike. Not since Frank Herbert’s DUNE books has there been such an intricately plotted space saga that echoes all the action of the early days of science fiction yet is tempered with the talented sensibilities of a modern day pulp adventure. What never fails to amaze me is, in the midst of these clashing futuristic armies and navies, Plexico still manages to define his characters so distinctly as to make them compelling. He never loses sight of the fact that no matter how grandiose in scope a story may be, it must never overshadow the simple truths of its characters. 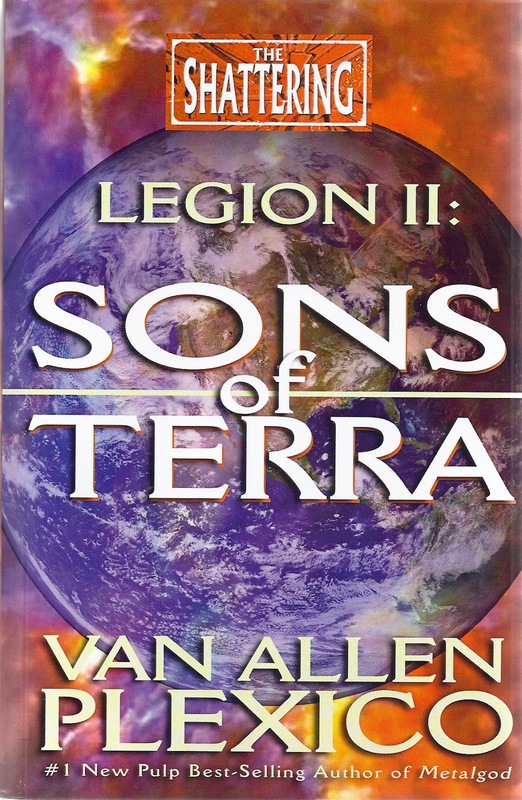 LEGION II SONS OF TERRA is another amazing chapter that leaves us anticipating the final book with so nail-biting anxiousness. For this reviewer, it can’t get hear fast enough.